it was time for a new jumbo-sized sketchbook having finished the very last page in THIS one. so i rummaged around in my bookcase and found the perfect book with a cover i like. the inside text block was written and illustrated in the 1940’s. i will keep it because the illustrations of the animals are fabulous and will make great drawing & painting fodder. the writing is also quaint, yet surprisingly informative! you better believe i was happy to just fold the watercolor paper in half and not have to make any size adjustments. the 12×18 pad i had was perfect. my friend nadia & i had a playdate scheduled before my new sketchbook was stitched into existence, so i just used some of the pages i’d already folded. we did a 10-minute table draw excercise. no time to think just draw! blind contours add so much personality to a page dontcha think? these are from 2 art retreats ago… i pulled this sketchbook out of the bookcase to study the binding and opened to this page. i present the cover to my new sketchbook/visual journal. i’m really getting my money’s worth out of some 19th century french bank notes i purchased last year. as far as i can see they go with everything even a baby polar bear biting his mama’s tail. why not? i’ve decided to stop numbering my sketchbooks & visual journals. it’s a pain in the tuchus to try and figure out which number i’m on without an index of some sort and i’m apparently not as practical as i think i am because i don’t have one. the date emblazoned on the cover will have to do! after the 112 degree heatwave we had a couple of weeks ago, my garden has recovered nicely. i had a branch on one of the trees burn to a crisp, but as advised by the newsletter from a local public garden, i’ve not done any pruning. those withered branches can help protect the ones underneath should another heatwave arrive. and surely one will because we aren’t even into our hottest summer days yet. slow deep-trickle watering and a large oak canopy worked to protect many of the plants. also everything is such a tangle. very few of my plants are all aloney on their owney without the protection of some random branch or cascade of leaves to provide shelter. this rosette succulent below didn’t burn, but it changed from a pale creamy green to this dusky purple. i like it! 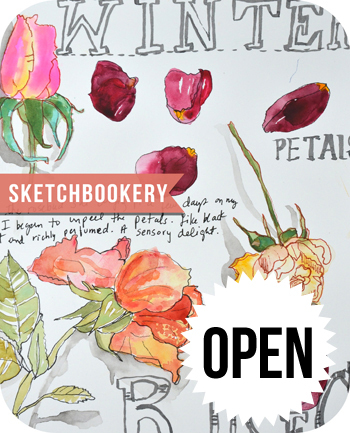 i permanently reduced the price of SKETCHBOOKERY since it’s been a little over 4 years since it was released. OMG & STITCH*BOOKERY are both on sale this month ($20 off) lately i’ve been rotating the classes that are on sale, a different one each month. 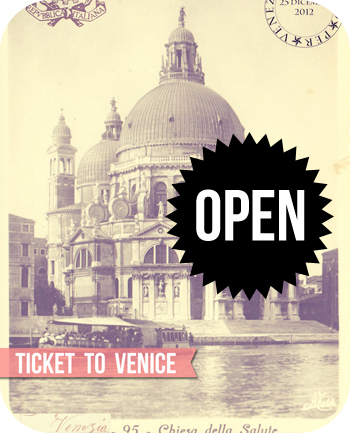 and finally, i also made some permanent price reductions on TICKET TO VENICE & FULL TILT BOOGIE. the links to all the different classes are HERE. i will most likely offer another class in 2019. i feel the first stirring of a big idea. these things can’t be rushed though, my creative unconscious operates on its own timetable and doesn’t consult me. let me know what’s shakin’ in your neck of the woods. i insist upon knowing about any travel or retirement plans you’re hatching, any memoirs you’re writing, cakes you’re baking, books you’re reading, or anything else you think i need to know. over and out pilgrims! I love that you number them!!!!!! I just returned from the Maine coast and eating delicious fried clams (which I only eat when I am in Maine too, Beth L). I am sad to hear that the Hamilton book is blah. I am listening to Isabel Allende’s House of the Spirits (thumbs up) and just finished reading This Is How You Lose Her by Junot Diaz (interesting but neither thumbs up nor down). Your journal is fabulous with those little labels, and I really love that black tin holding your linen thread. Can’t wait to hear more about another Mary Ann Moss class in the making! I don’t think I have anything interesting going on here in Alcatraz East, but if I do think of something, you’ll catch up with me on FB. BUT, I’ve developed an immediate affection for a sketchbook cover with a baby polar bear hanging onto its mother’s tail. I’m headed to Seattle next week for 10 days to get out of the Texas heat. Staying for 3 nights at my fav, Cedarbrook Lodge and then Airbnbs. I’m fiddling with retirement… just enjoying my free time until another job happens. I’m fixing to be 61. I’m proud of myself when I reign in the fears of running out of money. Love having the time to read. Can I borrow alone on my owner? Have an IG to make of it. freetime until the next job happens sounds like the way to live! Preparing for our annual summer travel to Maine and New Brunswick. Visiting family and friends, going to flea markets and enjoying FRIED CLAMS which I only like when I get them in Maine!!! Have got my small travel journal ready…. Not so much for art but memories. I put it together travelers journal style with lots of blank pages, some holders for cards and papers I will need…… For the cover I used a placemat from Dollar Tree. Nothing fancy but I like it. We are having too much rain and heat where I live. Feel like we are in a tropical jungle. Wish we could share some of the water to folks who need it. Still reading A Gentleman in Moscow (fabulous) and All Who Go Do Not Return (also great). Trying to decide which 40 or so books to take on vacation 😉 V excited about this little crumb of news about a new class in 2019! I’m with Sharon: I am obsessed with all the classes I’ve taken from you. Still poring over all the instructions, videos, etc. BRING IT ON, MAM! your new class enthusiasm delights my inner class builder. enjoy your vacay! i will make note of this! Oh, your sketchbook looks fab already, I just love those blind contours! I am thinking that was so much fun when I did it is sketchbookery, and I think about that class every single day, no lie, and how I enjoyed it, and how I can make the time to finish it. Oh there is so little time when you have to work full time. % more years till retirement….On another note, your garden looks amazing and so lush for such hot weather, just dreamy to me, I love it! meant to say 5 years till retirement! thanks sharon…and i hear you about so little time for us working stiffs. drat!